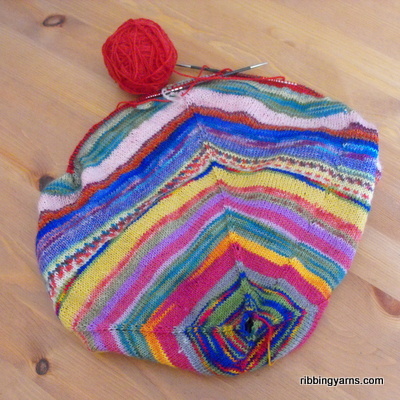 ← WIP Wednesday: The Amazing Time Travelling Sweater Bag! 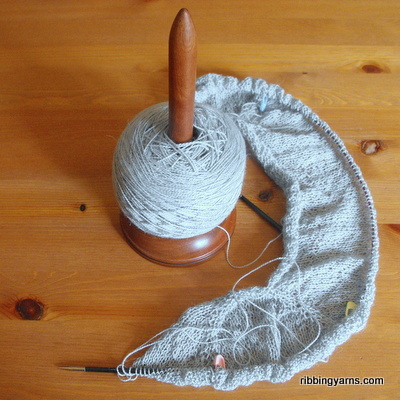 WIP Wednesday: Knit Goblins and Mojo Medicine! Have you ever got up in the morning to find that the knit goblins have paid you a surprise visit? 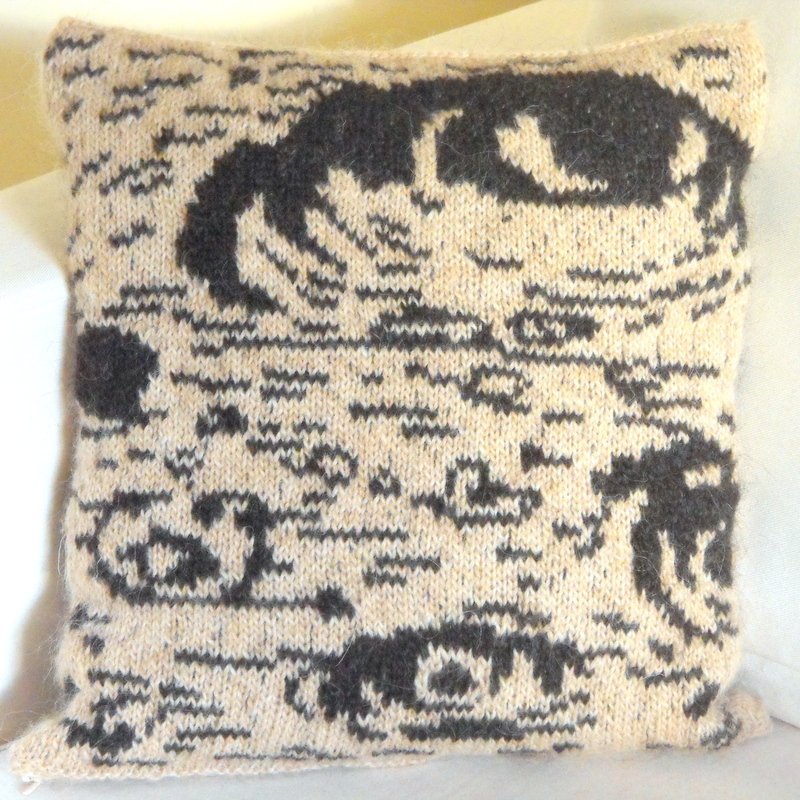 Sweaters mangled from late-night knitting, curious cats or general absent-mindedness? Well, this is what happened to one of my projects this week, and in this case it was my own daft stupidity that has now stopped my Dahlia cardigan in it’s tracks. 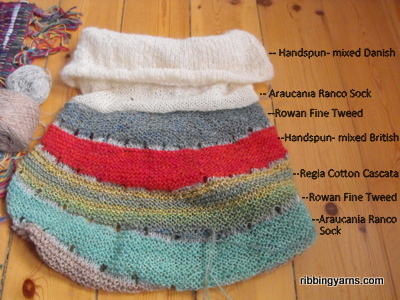 I had started the cardigan with undyed Araucania Ranco sock yarn- I had bought loads on ebay with a view to dyeing it, so there was plenty there. I’d also bought some previously as part of a completely different batch of yarny loveliness, and I often break a bit off to secure skeins when I’m setting handspun yarn, so there are odd balls of it here and there in the flat. 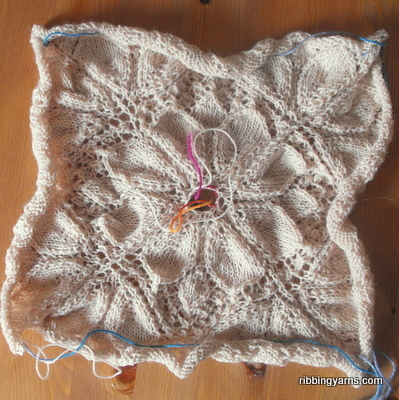 Anyway, I merrily started knitting with one of these oddments, did the beautiful complex square lace panel, and ran out of yarn shortly after. I delved into the bag of sock yarn for another skein, only to realise that it was a completely different shade of white! Of course I hadn’t bothered to check this tiny detail before I cast on. Lesson learned! If I’m honest, despite my “Arrgh!” moment, a part of me was a little bit relieved that I didn’t need to finish the project. I’ve been casting on things like crazy recently (yes, I know, again), getting bored and casting on something else, and I’ve felt restless and unfocused where I normally like nothing better than a gorgeous pattern and a bit of easy knitting. I’ve also got Hannah Fettig’s beautiful Featherweight cardigan on the needles, which I LOVE and am determined to finish and know I will get a lot of wear out of…but I had zero mojo to get it done. I kept picking it up, doing about one row and then getting restless for something else. So this is what I figured out. I’m yearning for multicoloured madness and the knit equivilent of jumping on the back of a motorbike and feeling the wind in my hair. Right now, I need my knits to be colourful and experimental- that seems to boost my creative brain and get me smiling :) So I switched things up, and so far it’s working brilliantly. The single-colour projects get their few rows done here and there when I can appreciate them, but the mad ones are having most of my creative focus. My Round and Round it Goes, Where it Stops, Nobody Knows! blanket came with me to the knit cinema last week and was perfect for watching a comedy! It’s great for playing with colour without having to think much about the end product, which I find kind of exciting and childlike. If I get bored, I can stop. It’s great as it is, but it will also be lovely as a huge throw, just to see how big it can grow! Possibly one of the kings of crazy-and-colourful knit design is Stephen West. I love his playful approach to design and had been telling myself to finish my other projects before casting on one of his designs…but, but!…I couldn’t resist! To get my sweater mojo back, I needed some Enchanted Mesa medicine! This is such a fun pattern if you like throwing your leftovers together and creating something beautiful. The sizing determines the weight of yarn to use, which meant i could combine my handspun with sock yarn and some tweed left over from the Time Traveling Sweater Bag project. Hey presto! My sweater mojo has returned. All it needed was for me to lighten up and take a new direction. This entry was posted in Knitting, WIP Wednesday and tagged boosting creativity, cast on all the things, Colourful Knitting, Creativity, Dahlia cardigan, Enchanted Mesa, Featherweight Cardigan, Handspun, Hannah Fettig, Knitting, Knitting Mistakes, Mojo, Playful Knits, Stephen West, Strik, westknits. Bookmark the permalink.